2012 BBQ at Bobby's ranch. The club had a great turnout for the annual BBQ. 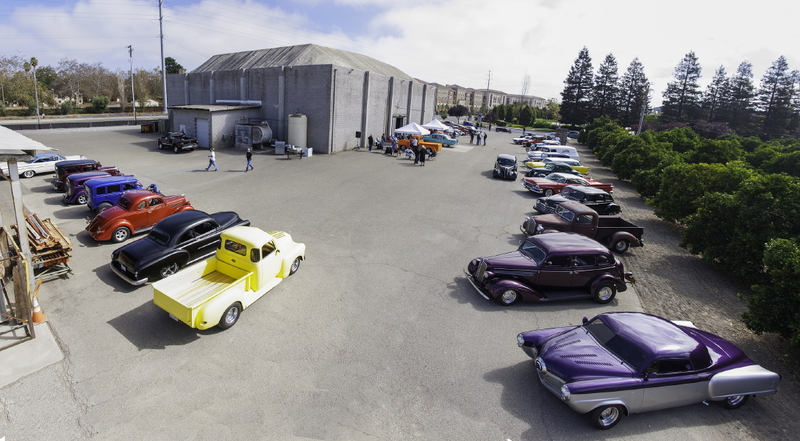 Almost 50 cars showed up at Bob's ranch for the BBQ. 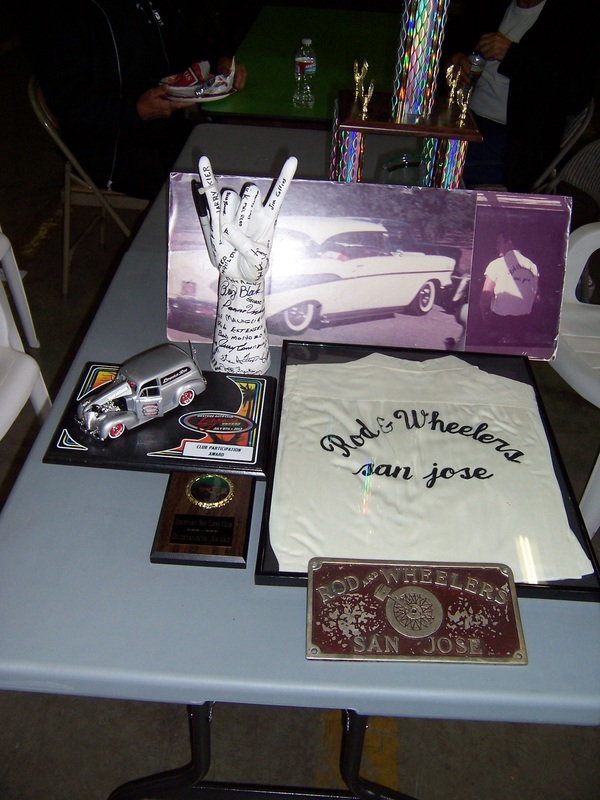 Club memorabilia was on hand for viewing. Some of this stuff goes back to 50's. Thanks Joe M. for sharing some of your stuff. 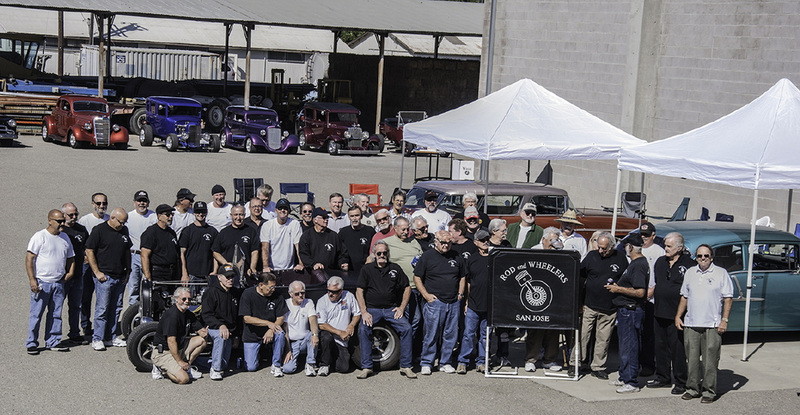 ​This was our 5th annual Rods at the Ranch BBQ and club get-together. The club thanks Bobby Moitozo and his family for hosting another great event at his ranch. At this years event we were greeted at the entry by a spectacular 1923 Model T farm truck from a Moitozo ranch which was reconditioned by our own Bobby Moitozo. The Model T truck was reconditioned by Bobby to commemorate his family's 100 year anniversary of the Moitozo's Bros family farming business. 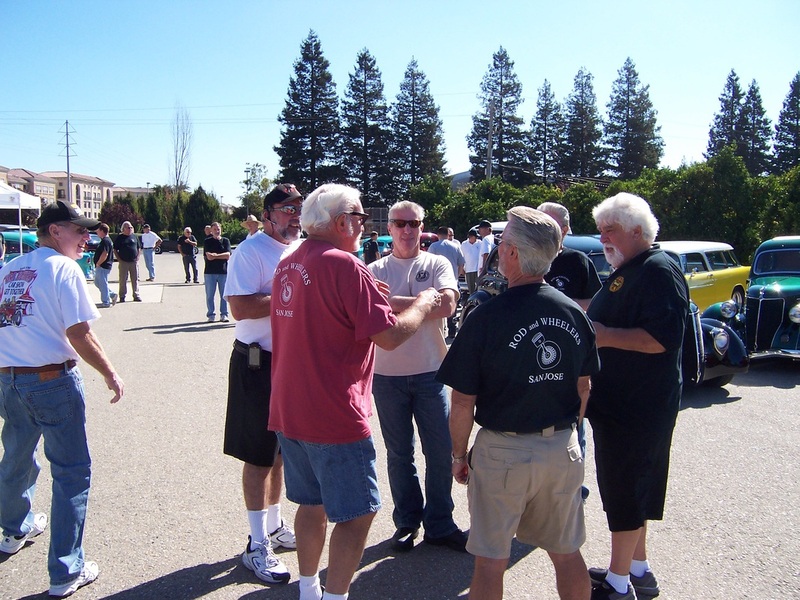 The Rod and Wheelers gang with original club member Dave Emmerling. . It was an honor to have Rod and Wheeler original member and Larry's buddy Dave Emmerling attend the annual BBQ. Pat's getting a golf lesson from Bobby! It was great to see Bobby's family members enjoying the BBQ. Bobby's 90 year old Aunt is ready to take a spin in the Garmin Gia she drove a few years back. She tells the story of how she got a few speeding tickets driving this car. She fits right-in with the Rod and Wheelers! After playing in Bobby's 34 (car in back ground) these two guys had to take a break to clean out their shoes and socks. These darn farm vehicles can get really messy inside. Preferred Parking? Without door handles you can't park there! Pop-ups are cool. Thats why God invented pick-ups. Nope - Nomads do not get free lunches. Real Nomads roamed the desert on Camels and did not paint them Yellow! More Pop-ups. He must own a pick-up. Thanks for bringing the Beer. Get your raffle tickets ready! Thanks Angie. Angie and her group support us every year. A big Thank You from the Rod and Wheelers. Car trophies make great table decorations and paper towel holders. All I see around this place are hot rods - Where are all the Pokemon's? Need some pin stripping - Gene is your Man. You got no ticket - no lunch. Gloria Block runs a tight-ship! Whats in the box? Its a secret but it taste really good. Lunch with Tony is always great even when its at the "Ranch"
You can always tell when one of Bobby's family members is around - just look for the Cow Boy hat and boots. Tony is the master and he is still teaching these guys a thing or two. Do Hot Rod guys and gals know how to put on a BBQ?? We should change our name to Rod and Wheelers BBQ club. Are Jeff and Steve tasting all the great food or organizing the BBQ? The trucks shown in the back ground delivered all the food. I've been so busy I didn't have time to eat but I finally made it along with the most important thing - Coors beer. Thanks Duane for all your hard work you put into making our annual BBQ come together so well. You are the champ! Duane who? I have not seen him since he started working on organizing this BBQ. The Rod and Wheelers also thank Nancy for all her hard work towards making this BBQ happen. Duane could not do it all himself. I may drive a Plymouth but I know how to drive all these farm trucks also. There all the same! The San Jose Fire Dept were guest this year. They are shown giving a few of our younger Rod and Wheelers a tour of the fire engine. Larry and Duane are making the final presentations including the Fireman's car awards pics and a special appreciation award to Duane. Remember - no burn outs! Starting with the photos below a slide show will begin with a feature that allows the viewer to control the pace and to pause a photo for longer viewing. Just hover the curser over the photo to start slideshow.